Australia has witnessed widespread destruction of property, and tragically of life, as a result of natural events such as flooding, storm damage, cyclones or fire. The task of rebuilding can be heartbreaking and made more difficult for those who are doing it for the second or third time. The following alternative will not appeal to everyone but it some readers might find it appealing. The one asset that generally retains its value after a natural disaster is the land. An alternative to rebuilding is to sell the land, add insurance payouts where applicable and to use the funds to purchase a motorhome, fifth wheeler or caravan. Alternatively retain the land and set up a power pole (the same or similar to those used by caravan parks) and maintain a water connection. Garbage services will still be available and dump points can be used to dispose of waste. One of the great benefits of a mobile home is that it can be moved away from any impending weather threat and placed in an area of safety. Admittedly the available living space is much less than a conventional house but much easier to maintain and clean. The mobile home means you have the option to travel or remain in your local community. In my travels I have met many people who have sold and or rented their house and are using their mobile home as permanent accommodation. Those who have done this are full of praise for the freedom and more flexible lifestyle that the mobile accommodation provides. If you live in a mobile home then I would welcome your comments on the pros and cons. Any business providing goods or services to the caravanning community may now display information and photos on the Caravan Park Photos website. The Business Listing Service was launched in February 2010 and users of the site will now have an opportunity to see photos of caravans, motorhomes and associated accessories. The service will also promote the location and photos of companies that provide caravan repairs and servicing. 1. We set up a listing page for you similar to the one for ABCO Caravan Sales Service Repairs Your listing page may contain up to 30 photos. You have the option to purchase additional listing pages if you so desire. Click here to promote your business to thousands of enthusiastic caravanners. 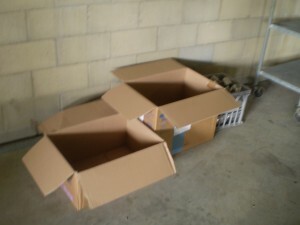 The Coffs Harbour Nursing Centre has a supply of packing cartons which are ideal for people who are either in the process of moving or are planning to move. Please contact Rodney on: 0408 461 479 if you would like more information. 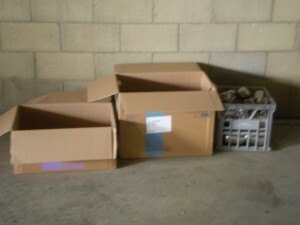 The cartons are in good condition as you can see from the photos below. Motorhome with Car in Tow. I took this photo at a rest area north of Newcastle. It seems to me that the owners of this Winnebago have got the ratio right between a motorhome and a car. It looks good and seems to fit together OK. I was very impressed with the matching decals. Posted on May 29, 2009 May 29, 2009 Author JohnCategories PersonalTags motorhome1 Comment on Motorhome with Car in Tow.